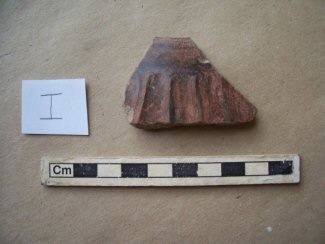 Residue on a Bayo Brown ceramic sherd. The sherd is a predominantly Barra Phase type found in the fill of the Mound 6, Structure 4 floor (Powis et al. 2007, 2008). Bayo Brown sherd with theobromine residue. This is a narrow mouthed tecomate (neckless jar) with vertical exterior fluting (Powis et al. 2007).